Gov. Brad Little delivers his State of the State address Jan. 7 at the Capitol in Boise. BOISE — A bill that would ban handheld cellphone use while driving in Idaho will be heard on the Senate floor. The bill from Sen. Jim Rice, a Republican from Caldwell, is the second piece of legislation to be introduced this session that would make laws on cellphone use uniform across Idaho. While Idaho already has a statewide ban on texting and driving, a handful of local governments around the state — including the cities of Ketchum and Hailey and Blaine County itself — have put in place ordinances banning all handheld cellphone use behind the wheel. 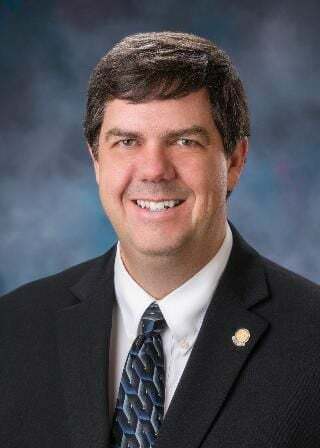 Rice’s bill, which passed through the Senate Transportation Committee on a 6-2 vote Tuesday, follows a bill from Rep. Chad Christensen of Ammon that would void the cellphone bans in Blaine County and prevent other local governments from passing similar ordinances. Christensen’s bill has not yet had a hearing in the House Local Government Committee, where it was introduced. “We’re starting to develop a patchwork in our state of different handsfree device regulation,” Rice said. The bill from Rice would ban the use of handheld devices — including phones, tablets, and laptops — while driving, with a few exceptions including for emergencies, on-duty law enforcement, and hands-free GPS use. The bill would also prohibit drivers from driving with headphones or Bluetooth devices in more than one ear at a time. Under the bill, a first-time offender would be fined $50, a second-time offender $100, and a third-time offender $200. Repeat offenders with three or more offenses within three years may also have their license suspended. The bill would also void all local bans on handheld cellphone use that are currently in place. Existing state law prohibits texting while driving, but city officials in Ketchum and Hailey say the statute in place doesn’t go far enough. Current law essentially requires police to get a warrant to look through a phone to prove the suspected texter was indeed texting rather than, say, reading an email or scrolling through Spotify. Because of the difficulty in enforcing the state’s texting and driving ban, members of law enforcement say, citations are relatively rare — with the only legal alternative being the harsher misdemeanor charge of distracted driving. Many distracted driving citations occur only after a crash has already taken place, Rice told the committee. “It’s after we’ve already created the worst result,” Rice said. The Idaho Sheriff’s Association is in favor of the bill, spokesman Michael Kane said at the hearing. “The one thing about freedom I’ve always believed is the freedom to swing your fist ends at the tip of my nose,” Kane said. Several insurance lobbyists also testified in favor of the bill, citing statistics related to distracted driving crashes. The bill’s opponents include the Idaho Freedom Foundation. Spokesman Fred Birnbaum urged the committee to return to the bill to its sponsor, saying he had concerns about how the bill might affect Uber and Lyft drivers. Rather than implement a statewide handheld cellphone ban, Birnbaum said, he would like to see the Legislature change its distracted driving law to give law enforcement more discretion. Two committee members voted against the bill: Sen. Carl Crabtree, a Republican from Grangeville, and Sen. Van Burtenshaw, a Republican from Terreton. Burtenshaw expressed concern that his son, who frequently uses headphones in both ears with his iPhone, would be cited under the bill, along with other young people.